These are the Medium Square Size of Flavor Strips that slide into the clear plastic buttons used on many of the older single price machine. 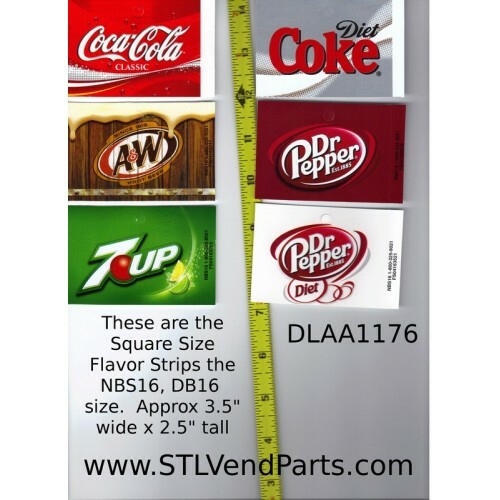 Not all flavors are still available in this size, but we carry many of the most common MAJOR BRANDS and MOST POPULAR FLAVORS IN CANS. These are also used on many of the mechanical and Pro-Sumer grade machines where they slide into a track. THESE MAY BE CALLED FLAVOR STICKERS BUT THERE IS NO SELF STICK on them. You can see a partial list of what we stock by entering DLAA1176 in the search bar at the top of this screen. These are Licensed Vinyl Screen Printed Originals they are not Laser Printed Illegal Copies. These measure approx 2.25 x 3.25 wide plus a little bit of a tab. 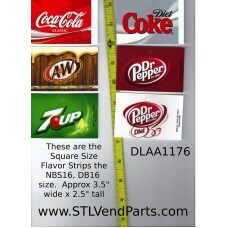 If your soda machine needs larger or smaller sizes go up to the Labels, Cards and Stickers heading at the top of the page.